It's a sport that's really catching on! 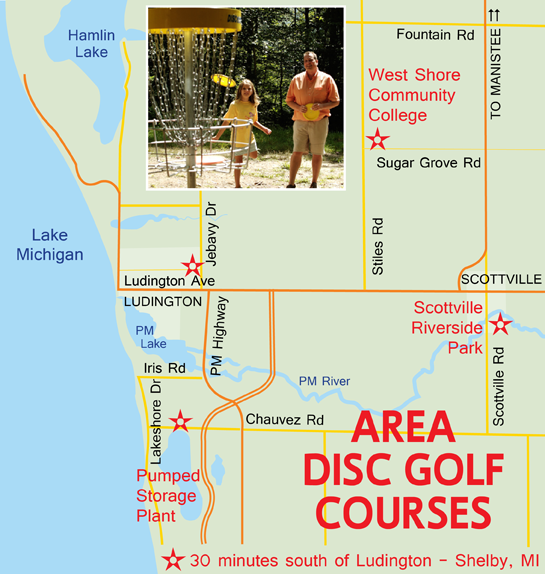 Disc golf is a big deal here in the Ludington area, with up to 20,000 people per year visiting one of our six courses. The Michigan State Disc Golf Championship is held in this area every Labor Day Weekend; 400 of the best disc golfers in the state compete for the top prize. For more information, go to Discraft Michigan State Championship. If you're not familiar with disc golf, here are the particulars: players toss a disc down a course and try to hit the target in as few throws as possible. The winner is the player who completes the course with the lowest score. Disc golf courses are normally 18 holes, but there are also 9-hole, all the way up to 27-hole courses. The game moves along faster and costs much less than regular golf--three discs cost around $30 and usually a $1 donation is all it takes to play a round. Discs can be purchased at Pere Marquette Expeditions on old US-31 south of Ludington. They also have free disc course maps available. 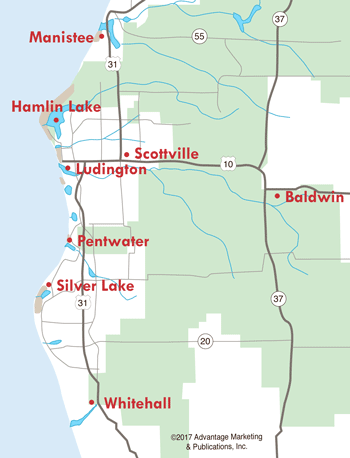 Mason County Park, off Chauvez Road near the Ludington Pumped Storage Plant, is the site for three 24-hole courses--Beauty (5,709 ft), Beast (7,093 ft), and Goliath (8,160 ft). It is the third largest course in the world, and considered to be one of the best facilities in the country. Leviathan is located off Jebavy Drive, just north of Johnson Road. This 150-acre parcel of land, known as the School Forest, has two courses, at 7,925 feet and 4,367 feet, respectively. The Mason County Disc Golf Organization has built a disc golf course along the edge of Scottville Riverside Park, appropriately named The Edge (4,851 ft). And now West Shore Community College has its own course, Labyrinth...a par 3 that consists of two, 12-hole loops that can be played separately or together. The short course is 6,425 feet and the long course is 6,630 feet. About 30 minutes south of Ludington you'll find Flip City Disc Golf Course in Shelby. It is 7,679 feet for Pro, 5,693 feet for Amateur and 5,211 feet for Junior. Disc golf is a great sport for anyone, regardless of your age or ability, and it can be played year 'round! It's a challenging game, and a wonderful opportunity for families to play together in a beautiful, wooded terrain. If you've got a couple hours, head out to one of Ludington's disc golf courses and give it your best shot!